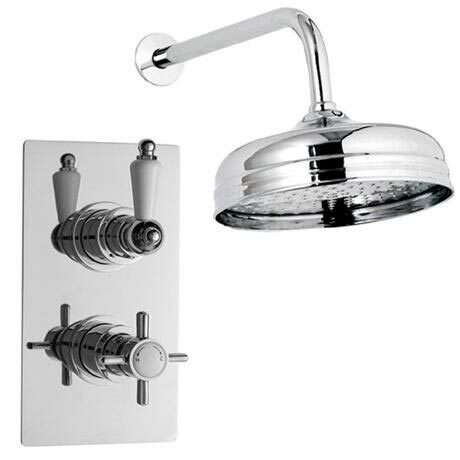 The classic chrome finished Beaumont Twin Concealed Thermostatic Valve with 8 inch Apron Fixed Shower Head from Ultra, complete the traditional look of your bathroom with the versatile Beaumont Shower Valve range. A thermostatically controlled shower with separate controls for the flow & temperature. Suitable for all types of plumbing installation this shower valve has the added safety benefit of a built in anti scald device should the cold water supply fail. The elegance and style of our traditional bathroom shower collection generates an underlying tone of bathroom quality. The complete shower package for any period style bathroom.